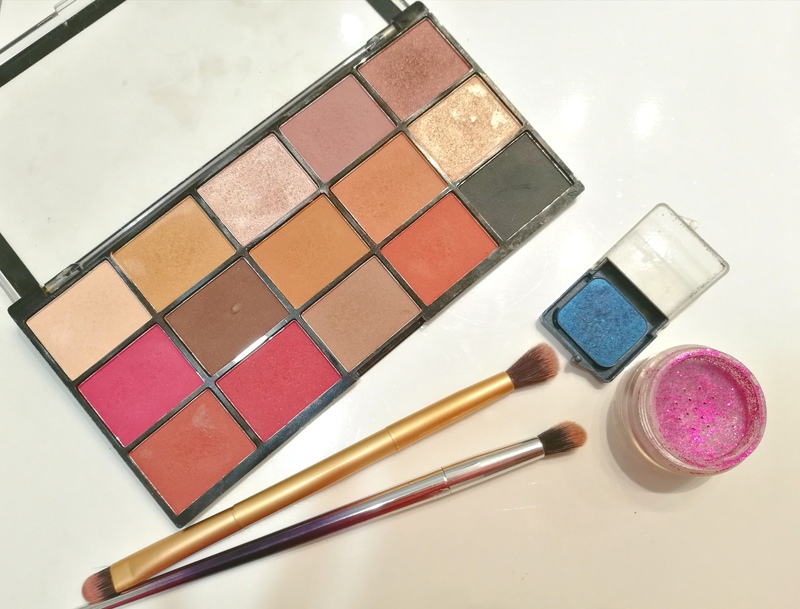 So to create the eye makeup I used the Makeup Revolution Reloaded Vitality palette. Para crear el look de ojos usé la paleta Makeup Revolution Reloaded Vitality. 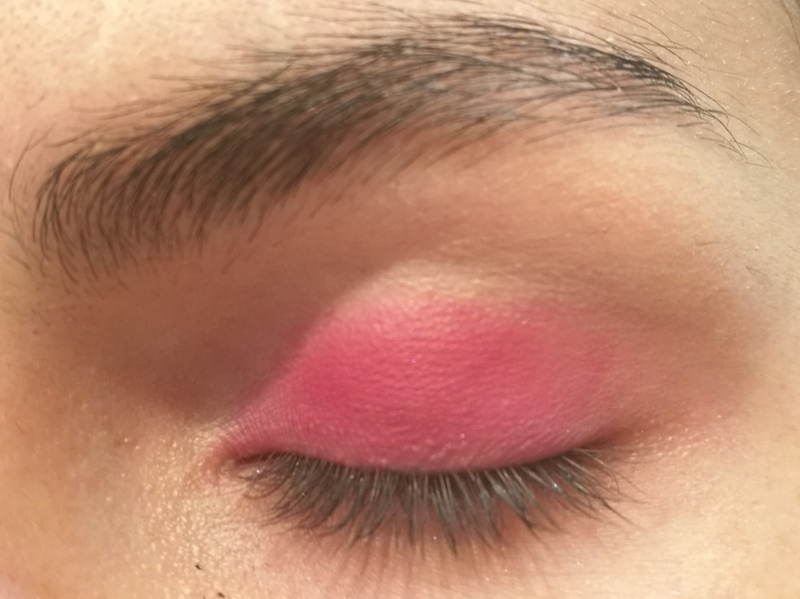 First with the flat part of the golden brush I applied the fuchsia eyeshadow all over the eyelid. Primero, con la parte plana del pincel dorado, apliqué la sombra de ojos fucsia en todo el párpado. 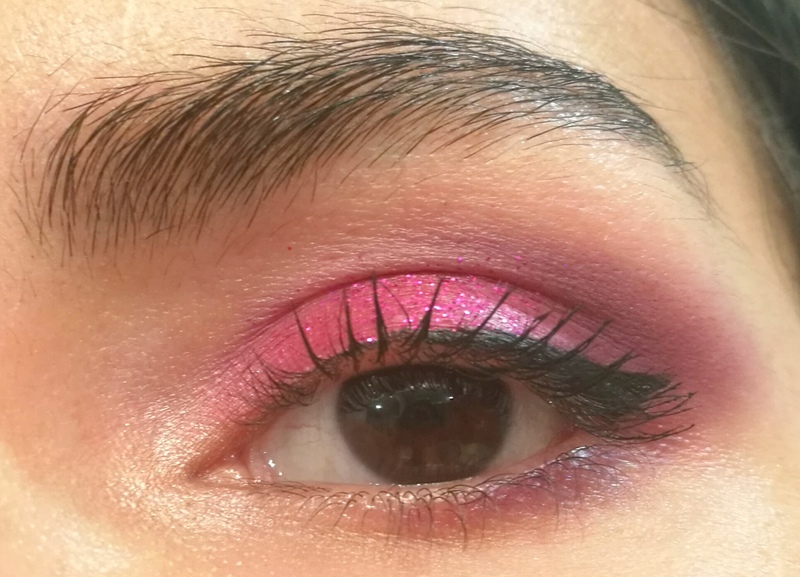 Finally using the fuchsia loose glitter I applied it on the centre of the eyelid to add some sparkle to the look and make it more interesting. 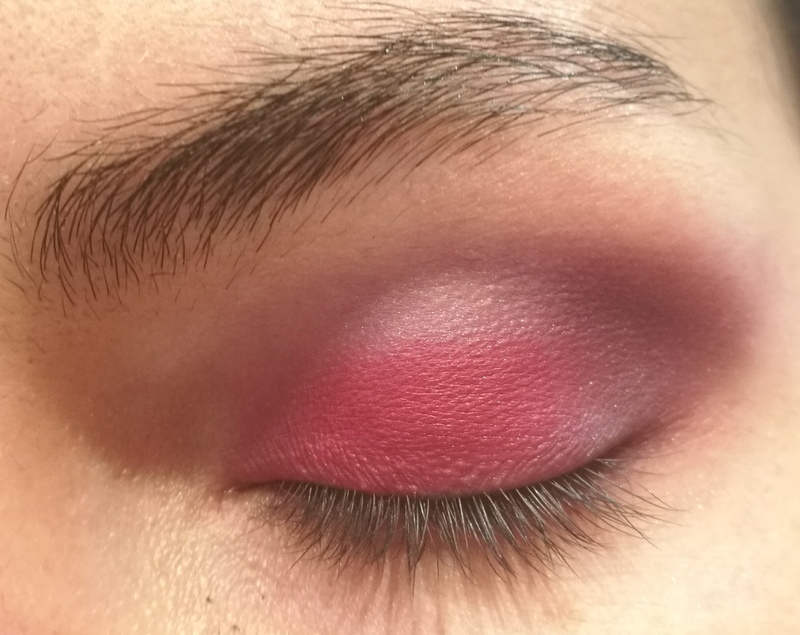 Finalmente, apliqué la purpurina fucsia suelta en el centro del párpado, para agregar un poco de brillo al look y hacerlo más interesante. For my face I applied the Bourjois 123 perfect CC cream in the colour light beige all over my face with a beauty blender. 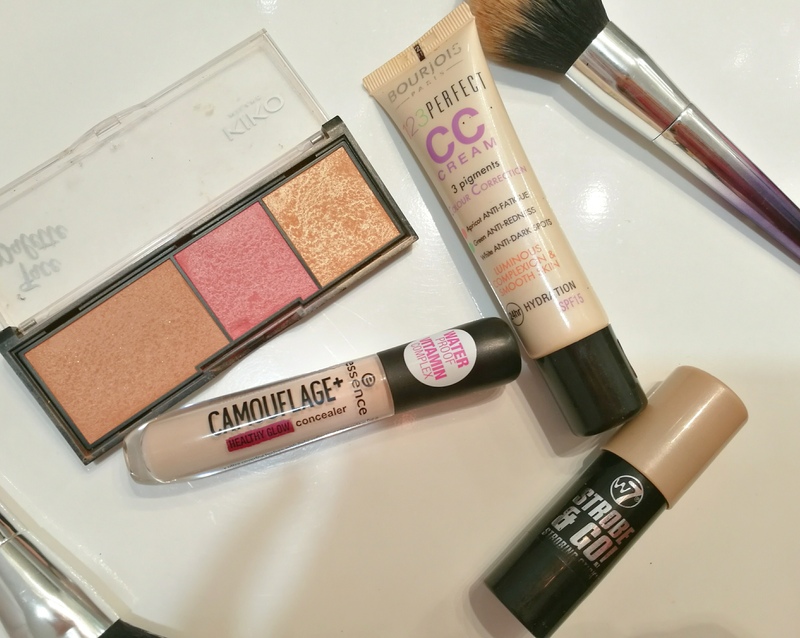 As a concealer I used the Essence camouflage Healthy glow concealer to get ride of my imperfections and my dark circles. I also highlighted the centre of my forehead and over my jaw. 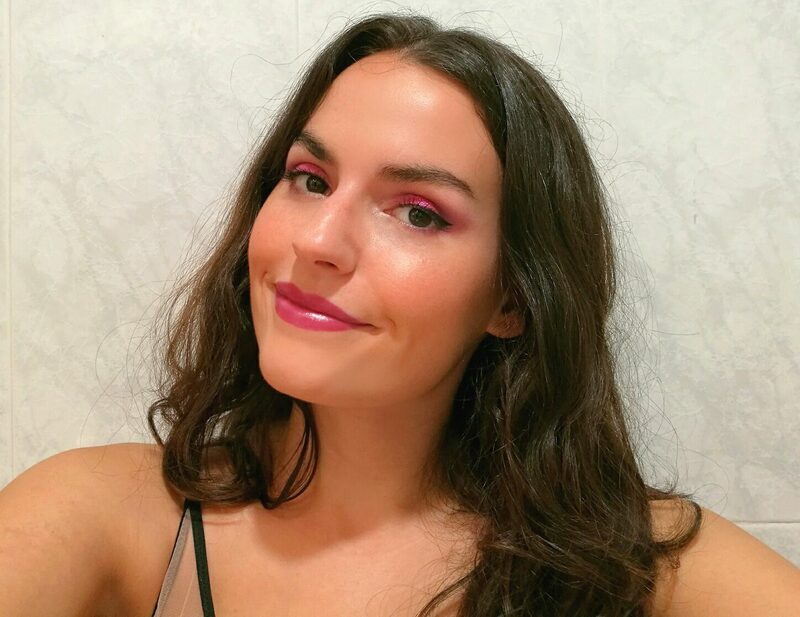 I bronzed up my face with the Kiko face palette bronzer, I applied it on my jaw line, right under my cheeks, on the top of my front and on my temples. On my apple cheeks I used the blusher from the face palette. For highlighter I used the W7 strobing stick on the highest point of my cheeks. En el rostro apliqué la Bourjois 123 perfect CC cream en el color beige claro en toda la cara con un beauty blender. Como corrector utilicé el corrector liquid camouflage de Catrice para controlar mis imperfecciones y mis ojeras. También iluminé el centro de mi frente y mi barbilla. Me bronceé la cara con el bronceador de paleta facial de Kiko, lo apliqué en mi línea de la mandíbula, justo debajo de las mejillas, en la parte superior de mi frente y en las sienes. En las mejillas de las manzanas utilicé el colorete de la paleta de la cara. Para highlighter usé el W7 strobing stick en los puntos más altos de mis mejillas. Do you like glittery eye looks? What did you think about Ariana’s side to side makeup look? ¿Te gustan los looks con purpurina? ¿Qué pensaste sobre el maquillaje de “Side to Side” de Ariana? I love this post.i read your blog fairly often you”re always coming out with some great stuff.i shared this on my Facebook and my flowers loved it keep up the good work . Very Greek and very good. That shade of pink looks stunning on you! Gorgeous look! Not only is the pretty, it’s helpful and easy to follow! Thank you! Bright and summery, I love this colour. It’s v cheerful!